https://sep.yimg.com/ay/yhst-33477391359232/open-brain-coral-red-trachyphyllia-geoffroyi-green-open-brain-coral-9.jpgOpen Brain Coral (Red) - Trachyphyllia geoffroyi - Green Open Brain CoralModerateSemi-aggressiveYesCalcium, Strontium, Trace elementsIndo-PacifcTrachyphylliidaeSmall 2" - 3"
Open Brain Coral - Trachyphyllia geoffroyi A great starter coral, Open Brain Coral is a great add-on in your marine aquarium. 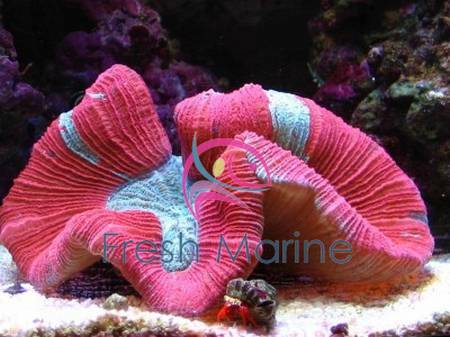 Its fluorescent properties add considerable display value to the reef tank they are placed in. Taxonomy: Open Brain Coral belongs to the Kingdom Animalia, Phylum Cnidaria, Family Trachyphylliidae, Genus Trachyphyllia and Species geoffroyi. Scientific names: The scientific name of Open Brain Coral is Trachyphyllia geoffroyi. Other common names: The other common names of Open Brain Coral are Pacific Rose Coral and Pink-Red Open Brain Coral. Coral Type: Open Brain Coral is a Large Polyp Stony (LPS) Coral. Origin or natural range: Trachyphyllia geoffroyi originates in the Indo-Pacific region including the Red Sea, the Australian archipelago and Indonesia. Size: Open Brain Coral grows to about eight inches in diameter in a marine aquarium. Color: Trachyphyllia geoffroyi occurs in the variations of pink, red, brown, tan, grey, green and blue colors. Compatibility: Open Brain Coral is non-aggressive towards the other marine aquarium invertebrates. Trachyphyllia geoffroyi may settle down solitarily or in colonies on sandy or muddy bottoms of the coastal reefs. Open Brain Coral is nocturnal in habit and spreads its tentacles at night. Open Brain Coral is quite sturdy. As the name suggests, the structure of Open Brain Coral resembles the appearance of the cortex of a primate�s brain. Trachyphyllia geoffroyi builds reef which has many big sized septa. Open Brain Coral has large paliform lobes with small teeth like structure on its Calcium Carbonate skeleton. Trachyphyllia geoffroyi has a single large polyp with a fleshy base. The polyps of Open Brain Coral inflate considerably in size with water, about two to three inches beyond its skeleton, during the day time. Trachyphyllia geoffroyi has short tentacles for feeding only and lacks long sweeper tentacles. A colony of Open Brain Coral has many mouths. The coloration of Trachyphyllia geoffroyi varies with the marine depth level of its existence and the turbidity of water around Open Brain Coral. Trachyphyllia geoffroyi may secrete mucus sometimes. Temperature of water: 72 to 78 degrees Fahrenheit. Open Brain Coral needs low water movement in the marine aquarium it inhabits. Strong water movement in the aquarium may hamper the complete expansion of Trachyphyllia geoffroyi. Keep the water clean in your marine aquarium. Open Brain Coral requires moderate illumination in the marine aquarium hosting it. Actinic blue lighting or MH lighting is recommended for Trachyphyllia geoffroyi. Open Brain Coral grows slowly but continuously if it gets amenable growth environment and ample nutrition in your marine aquarium. Place Trachyphyllia geoffroyi on a fine substrate in your marine aquarium as the rocky bottoms may tear off the coral�s tissues. Place the Open Brain Coral away from the other aggressive corals in your marine aquarium, to prevent the coral�s stinging by the other aggressive corals. Open Brain Coral derives its nutrition chiefly through photosynthesis which is performed by zooxanthellae, a photosynthetic alga living symbiotically within the coral. Open Brain Coral is Carnivorous in its feeding habit and filter feeds not more than twice per week, when open at night. Open Brain Coral feeds upon acellular marine invertebrates, meaty bits of fish, crustaceans, shellfish, raw fish, Silver Sides, phytoplankton and zooplankton. Add Iodine, Strontium and Magnesium as dietary supplements for Open Brain Coral. Keep phosphate and nitrates level at zero in the water. Breeding: Don�t try to propagate Open Brain Coral in your marine aquarium. Fragmenting the coral destroys it. Let it reproduce asexually on its own. Trachyphyllia geoffroyi propagates through fission naturally, in a marine aquarium. Open Brain Coral requires moderate care. Don�t keep Boring Green Algae and Trachyphyllia geoffroyi in the same marine aquarium.